The Mobile Service Tower at Space Launch Complex 37 has been moved away from the launch stand where a United Launch Alliance Delta IV Heavy and Orion spacecraft stand pointed skyward for launch Thursday morning. Weather forecasts continue to call for favorable conditions at launch time and there are no technical concerns reported tonight. 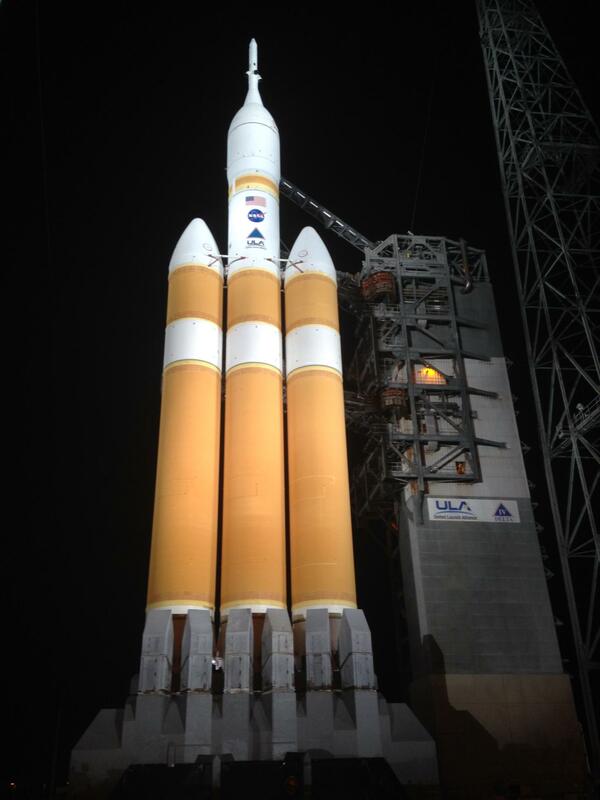 Liftoff of Orion’s first flight test is scheduled for 7:05 a.m. EST, the opening of a 2-hour, 39-minute window. Our continuous countdown and mission coverage will begin at 4:30 a.m. EST. NASA TV will begin coverage of the mission at the same time. 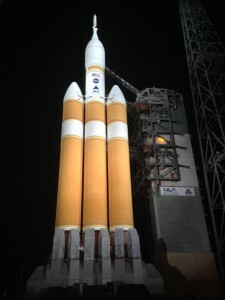 You can stream NASA TV throughout the countdown and flight of Orion at www.nasa.gov/nasatv. Good Luck Orion I have been following the space program since Mercury. Lets keep up the the great work! good luck on your mission! What no Chimp? It’s been nearly a half-century since the U.S. launched a new space capsule, and over 30 years since the first launch of the Space Shuttle. I’m going to get up early and watch. Of the four types of manned spacecraft the U.S. has launched, John Young made the maiden voyage on two of them. I think that, when Orion is ready to carry people, they should send John Young, the most accomplished astronaut in history, on the first flight. He’ll be about 85 years old at the time, but I still think he’s the man for the job.